It contradicts the circulated reports that anti death penalty house leaders would be removed on May. Majority Leader Fariñas moves to declare the post of anti death penalty house leaders as vacant. Even one of the allies of President Rodrigo Duterte, former President and now Pampanga representative Gloria Macagal-Arroyo removed from her position as Deputy Speaker. Only Occidental Mindoro Representative Josephine Ramirez-Sato of House contingent to the Commission on Appointments didn’t included in the house leaders who got removed despite of also opposing the death penalty bill. Two house leaders who were absent during the voting of the death penalty bill also got removed from their position. Arroyo thanked the President for understanding her stand on the death penalty bill and despite of being removed from her position, she would continue to support President Duterte and House Leader Alvarez. 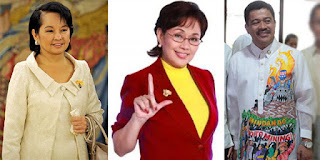 Santos-Recto said that she already expected to lose her position because of her decision to oppose the death penalty bill, but she said that she’s still joining the majority bloc.